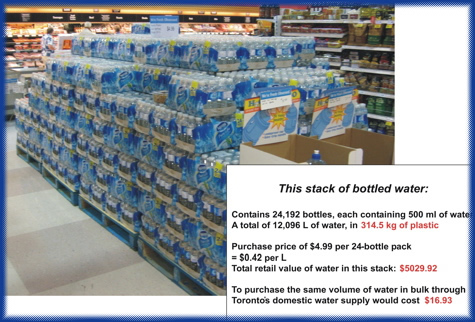 Regularly purchasing bottled alkaline water can get expensive really fast. The Natural Resources Defense Council has said that "bottled water costs 240 to 10,000 times more per gallon than your cities municipal tap water. "(NRDC , Banthebottle). The bottled water industry is very loosely regulated and nearly "40% of all bottled water starts out as tap water" (Businessinsider) and "studies have found bottled water to be no purer than tap water, and in some cases even harmful, with one out of every three containing harmful chemicals such as cancer-causing contaminants, bacteria, and carcinogens"(NRDC , EWG). With many of these contaminants being a direct result of the plastic bottle that is made from petroleum and the lack of regulation in bottling the water. Recent studies have discovered nearly 25,000 different chemicals inside a given single bottle of bottled water. Researchers tested 18 samples of commercially sold bottled water from around the world and discovered them to contain chemicals which interfered with hormone receptors in the human body. Tap water was tested as well, and no hormone interference was found. 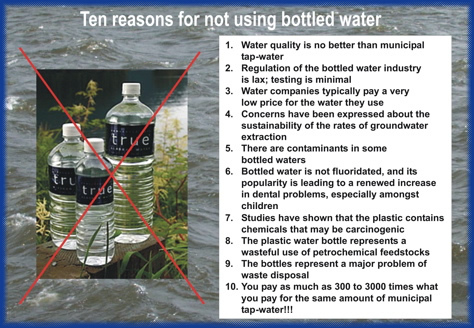 This lead the researches to look at the plastic in which the bottled water was packaged. Two classes of chemicals, maleates and fumarates used to manufacture plastic bottles, and known potent endocrine disruptors, were discovered in most of the bottled waters tested. Some of the harmful effects of endocrine disruptors (chemicals which interfere with hormones inside the body) are stunted growth, premature birth, infertility, early menopause, and early puberty - to name a few. Medical research also indicates that consuming these chemicals can trigger diabetes, heart disease, and certain forms of cancer. In other words, you may be taking a health risk just by drinking bottled water. According to the EPI Worldwide "2.7 million tons (2.4 million metric tons) of plastic are used to bottle water each year. The plastic most commonly used is polyethylene terepthalate (PET), which is derived from crude oil. Making bottles to meet Americans demand for bottled water requires more than 1.5 million barrels of oil annually, enough to fuel some 100,000 U.S. cars for a year, while transporting these bottles burns even more oil. Most of the bottles, about 86 percent become garbage or litter, according to the Container Recycling Institute in Washington, D.C. Plastic debris in the environment can take between 400 and 1,000 years to degrade"(National Geographic). Pollution from the production, transportation, and use of plastic water bottles has become so pervasive cities such as San Francisco, Chicago, and Seattle have attempted to ban the sale of bottled water. It is estimated that since the 1950's over 1 billion tons of plastic have entered the world's oceans. Today, in vast areas of the oceans known as gyres, where ocean currents deposit anything that floats, there are regions greater than the size of Texas, such as the "Great Pacific Garbage Patch" or "North Pacific Ocean Gyre" where plastic outweighs surface zooplankton 6 to 1. Since in the United States 93% of plastics are not recycled, we all must do everything we can to reduce and/or deny our use of one time throw away plastics whenever possible. Purchasing bottled alkaline water for use in the home is not only very expensive and unsafe, it contributes to this epidemic of plastic pollution that will last for thousands of years. In a study conducted by "the University of Iowa Hygienic Laboratory on 10 brands of bottled water revealed a wide range of pollutants, including not only disinfection by products, but also common urban waste water pollutants like caffeine and pharmaceuticals (Tylenol); heavy metals and minerals including arsenic and radioactive isotopes; fertilizer residue (nitrate and ammonia); and a broad range of other, tentatively identified industrial chemicals used as solvents, plasticizers, viscosity decreasing agents, and propellants"(EWG). Another study conducted by the National Resources Defense Council found that "after testing more than 1,000 bottles that about one fourth of the bottled water brands (23 of 103 waters, or 22 percent) were contaminated at levels violating strict enforceable state (California) limits for the state in which they were purchased, in at least one sample. The NRDC also found that almost one fifth of the waters tested (18 of 103, or 17 percent) exceeded unenforceable sanitary guidelines for microbiological purity in at least one test. In all, at least one sample of one third of the waters we tested (34 of 103, or 33 percent) exceeded a state enforceable standard for bacterial or chemical contamination, a nonenforceable microbiological-purity (HPC) guideline, or both"(NRDC). In other words, because the regulations around bottled water are so loose, you never really know what you are getting in your bottle. The better option is to use a home water filter system to remove those impurities so your family will have a constant stream of healthy water. Bawell alkaline water ionizer electrolysis machine systems were designed to be simple to use and easy to install. We want to make sure you always have access to healthy water that is PH balanced and purified of all those contaminants. Take a look at our selection of water filters and start improving your health, saving your budget, and helping the environment all at once. Bawell Water Ionizer Filter Systems are built to last with the level of quality you expect in a product that last for many years to come. That is why our machines are covered by a lifetime warranty however changing the filters on time each year is important to keep your machine working properly over its lifetime. Our systems feature an internal filter which can handle on average 6,000 liters or 1,585 gallons of clean water before it needs to be changed. In other words, if you were to produce four to five gallons a day, you would get about a year of service from our filters. Our internal filters do not remove sediments - dirt and other small particles which may or may not be visible to the naked eye. Users living in large older cities like New York City or users on well water will need to purchase and use an external sediment filter with their machine, like the one found in our Pre-Filter System, to prevent clogging of their machines and the filters inside their machines with sediments. If your tap or well water has high sediment count measured in TDS total dissolved solids, you need to use and external sediment filter such as our pre-filter system or a 3rd party sediment filter such as those sold at Home Depot to purify and remove sediments in your water before it enters your machine. Dirty tap or well water high in sediments can clog your filters and reduce their lifespan. Tap and well water quality is not uniform and some users will require more filtration than others based upon their local water quality. It is important to note that you should change your filter at one years time or when the filter life counter on your machine expires (whichever comes first), or if your water begins to taste bad which may mean your filter has expired. Our water ionizers also feature an optional pre-filter system for people who do not have drinkable tap water or water which is high in sediments. People living in a city with poor tap water quality or in places where they draw water directly from a well or other ground water source such as a river or a lake should use a pre-filter with their machine to remove additional gross contaminants and chemicals from their source water. If the city's tap water is higher quality and is considered drinkable then you do not need the pre-filter. 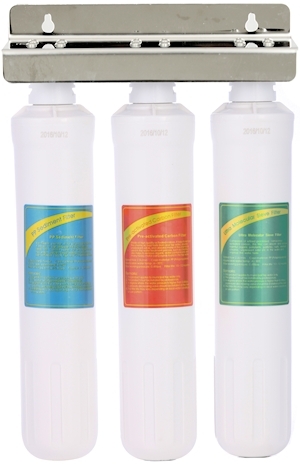 Our water ionizer filters will remove chlorine, pesticides including pesticide byproducts such as atrazine, industrial solvents (halogenated hydrocarbons), volatile organic compounds (VOC) and chlorinated hydrocarbons, polychlorinated biphenyls (PCBs), radon, benzene, arsenic, mercury, lead, chromium, heavy metals, polycyclic aromatic hydrocarbons (PAHs), taste and odor forming compounds such as MIB and geosmin, algal toxins, endocrine disrupting compounds (EDC removal) and other micro-pollutants, pharmaceutical and personal care products (PPCP removal), trihalomethane (THM) compounds like chloroform and other disinfection byproducts (DBP removal). Users concerned about Fluoride should know that Fluoride is a naturally occurring acidic mineral and is separated from the alkaline drinking water by ionization. When using your water ionizer alkaline and acidic water will be made at all times by separating the alkaline and acidic minerals in your tap or well water. Fluoride will be separated from the alkaline ionized water and go down the drain in the acidic water drain tube. You can see the acidic water drain tube in our installation video. This makes water ionizers one of the best technologies for removing Fluoride naturally. Individuals who are concerned about Fluoride can also connect their water ionizer to a reverse osmosis spigot or use an external activated alumina filter. Reverse osmosis systems have the highest degree of Fluoride removal at 95% or greater. Most Fluoride is actually obtained from fruits and vegetables, not from Fluoridated tap water. Tea has the highest concentration of Fluoride due to its high concentration in tea leaves. This list of Fluoride in common foods highlights the fact that Fluoride is a naturally occurring mineral found in many fruits and vegetables. Depending on your age and body weight your daily requirement of Fluoride to maintain bone health will vary. While you will get most of your daily Fluoride intake from fruits and vegetables, if you are concerned about Fluoride in your drinking water you can use a water ionizer machine to reduce its content. For an in depth list on how much Fluoride is present in the foods you eat, visit the United States Department of Agriculture. Since the Safe Drinking Water Act requires the EPA to strictly regulate contaminants in municipal city tap drinking water systems chemical contamination of city tap water does not pose a threat to human health. Contamination is of concern for those with private drinking water sources such as private wells where chemical contamination is likely to go undetected due to lack of testing and enforcement. Chemical contamination is more likely in bottled water due to lack of testing and Safe Drinking Water Act loopholes which exclude bottled waters from regulation by the Safe Drinking Water Act. For these reasons activated carbon filtration is very important for protecting private drinking water systems from chemical contamination. The Water Quality Association recognizes activated carbon for its ability to maintain drinking water contaminants within purity levels set by the Environmental Protection Agency National Drinking Water Standards. Since bottled water companies have managed to avoid regulation by the Safe Drinking Water Act they are not subject to government water quality testing. The fact is that your municipal city tap water supply is tested at least 3 times daily to be in compliance with the Safe Drinking Water Act. This makes filtering your tap water the best way to obtain clean drinking water that you know is purified. You can obtain your cities water quality report for free from the Environmental Protection Agency. You will find no such free publicly accessible water quality testing report for any brands of bottled water. Filtering your tap water for drinking is your best bet for drinking the cleanest and purest water possible. It's good for you, your wallet, and the environment. Other water filtering methods such as reverse osmosis, distillation, and standard water filtering simply don't offer the same health benefits mentioned in Bawell water ionizer reviews but you may use them in conjunction with our machines to achieve a higher degree of filtration. Alkaline water can offer many advantages over the standard, filtered water, including a range of anti-aging / health improving properties. Ionized water has been associated with enhanced rehydration, improving your efforts for weight loss, and even easing the pains associated with arthritis joint pain. Some research even suggests it has cancer-fighting capabilities since it acts as an antioxidant neutralizing free radicals inside your body. Our machines also let you chose the level of alkaline water or acidic water you use. Acidic water is more sterile than what you would normally get out of the tap, so it's a great option when you want to wash fruits and vegetables. There are a wide range of alkaline water benefits that just are not possible with other ordinary water filtering systems. 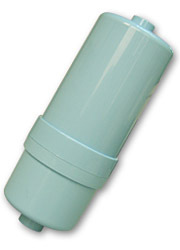 Silver Activated Carbon filter removes chlorine, pesticides including pesticide byproducts such as atrazine, industrial solvents (halogenated hydrocarbons), volatile organic compounds (VOC) and chlorinated hydrocarbons, polychlorinated biphenyls (PCBs), radon, benzene, arsenic, mercury, lead, chromium, heavy metals, polycyclic aromatic hydrocarbons (PAHs), taste and odor forming compounds such as MIB and geosmin, algal toxins, endocrine disrupting compounds (EDC removal) and other micro-pollutants, pharmaceutical and personal care products (PPCP removal), trihalomethane (THM) compounds like chloroform and other disinfection byproducts (DBP removal). The carbon impregnated with silver particles acts as an antimicrobial-antiseptic antibacterial agent attacking micro organisms and destroying their cell walls, eliminating their ability to live and reproduce. Tourmaline Mineralizing Biostone filter which is composed of mineralized energy spheres and coconut activated carbon. The Tourmaline in the mineralized energy spheres radiates far infrared energy which enhances ionization by reducing water cluster size and increasing the amount of dissolved oxygen in the water. The Maifanite stone contains high amounts of minerals and increases the mineral concentration in the water, allowing stronger more efficient water electrolysis. The Maifanite stone also aids in trapping and removing micro-organisms and heavy metals such as lead, cadmium, chromium, arsenic, and mercury. In addition coconut activated carbon is one of the most efficient GAC (Granular Activated Carbon) filtering materials removing chlorine, pesticides including pesticide byproducts such as atrazine, industrial solvents (halogenated hydrocarbons), volatile organic compounds (VOC) and chlorinated hydrocarbons, polychlorinated biphenyls (PCBs), radon, benzene, arsenic, mercury, lead, chromium, heavy metals, polycyclic aromatic hydrocarbons (PAHs), taste and odor forming compounds such as MIB and geosmin, algal toxins, endocrine disrupting compounds (EDC removal) and other micro-pollutants, pharmaceutical and personal care products (PPCP removal), trihalomethane (THM) compounds like chloroform and other disinfection byproducts (DBP removal). Good for 6000 liters or 1585 gallons filtered water. Drinking 4 gallons per day filter will last 1 year. 3 stage optional filtration system which can be used with all Bawell machines. 5 micron sediment filter which eliminates small invisible molecular size particles suspended in water. This includes particles containing sand, dirt, rust, colloidal matter, bacteria, and algae found suspended in your source water. The main purpose of this filter is to block particles and bacteria from entering the system and prevent clogging and/or contamination which can reduce the lifespan of the filters which follow in the system. This type of filter is used in locations where the source water is raw an untreated. You would use this kind of filter if you are drawing your water from a well, river, or lake without filtering it. This raw untreated source water requires pre-filtration since it can contain particles which will clog the filters. If you are already filtering your well water or source water or using a whole house filtration system or a reverse osmosis filtration system then this filter is not needed. If your city tap water is considered drinkable by the city then you do not need this pre-filtration system. 1500 liter lifespan. At 15 liters or 4 gallons per day filter will last 3 to 4 months. Pre-activated carbon removes chlorine, pesticides including pesticide byproducts such as atrazine, industrial solvents (halogenated hydrocarbons), volatile organic compounds (VOC) and chlorinated hydrocarbons, polychlorinated biphenyls (PCBs), radon, benzene, arsenic, mercury, lead, chromium, heavy metals, polycyclic aromatic hydrocarbons (PAHs), taste and odor forming compounds such as MIB and geosmin, algal toxins, endocrine disrupting compounds (EDC removal) and other micro-pollutants, pharmaceutical and personal care products (PPCP removal), trihalomethane (THM) compounds like chloroform and other disinfection byproducts (DBP removal). 4500 liter lifespan. At 15 liters or 4 gallons per day filter will last roughly 10 to 12 months. Ultra Molecular Sieve Filter composed of refined nano-porous activated carbon removes chlorine, pesticides including pesticide byproducts such as atrazine, industrial solvents (halogenated hydrocarbons), volatile organic compounds (VOC) and chlorinated hydrocarbons, polychlorinated biphenyls (PCBs), radon, benzene, arsenic, mercury, lead, chromium, heavy metals, polycyclic aromatic hydrocarbons (PAHs), taste and odor forming compounds such as MIB and geosmin, algal toxins, endocrine disrupting compounds (EDC removal) and other micro-pollutants, pharmaceutical and personal care products (PPCP removal), trihalomethane (THM) compounds like chloroform and other disinfection byproducts (DBP removal).